Hi there! Thanks for dropping by today! The Paleo and AIP diets are heavy in meat and vegetables, but I get stuck in a rut sometimes, do you? I’ve been experimenting with different vegetable combinations and seasoning blends to spice things up (literally and figuratively) on my dinner table. 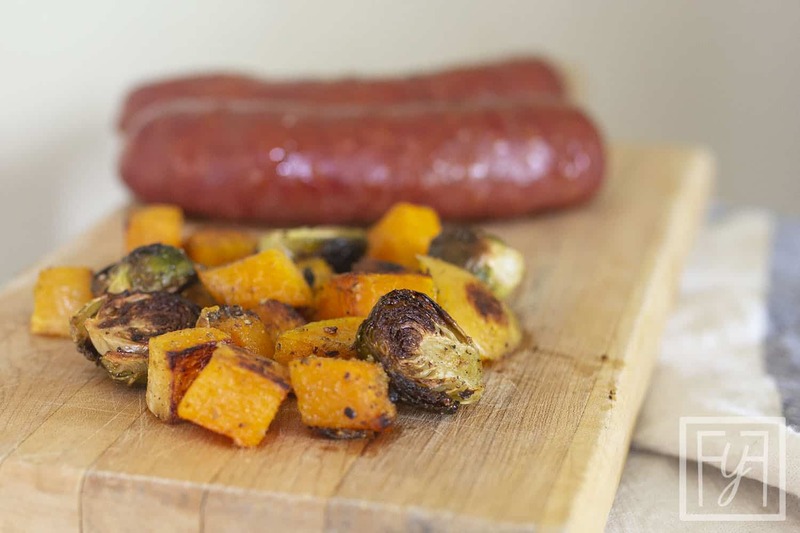 Today I’d like to share a winner with you: Roasted Butternut Squash and Brussel Sprouts. The seasoning is simple, and these two vegetables compliment each other nicely. Try it! 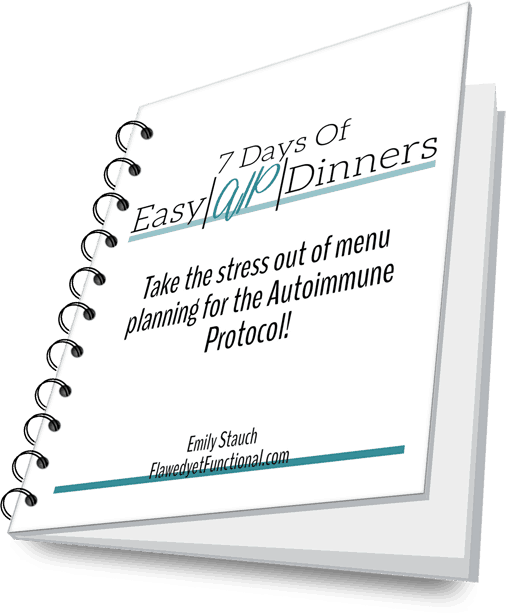 When I first started the Autoimmune Protocol, sweet potatoes were on our plates almost every meal. I’m not kidding you. We ate them all. the. time. Lately, I’ve been trying to keep my carbohydrate count lower so I’ve been looking for tasty vegetables that are lower in carbohydrates. Sweet potatoes have 20 net carbs per cup while butternut squash has 14 net carbs. Every little bit counts here, so I’ve been reaching for butternut squash often to replace sweet potatoes, and you know what happened? I’m actually preferring butternut squash! Sweet potatoes are almost too sweet, and the texture of butternut squash is more preferable to me. It’s easy to over-cook a sweet potato resulting in a mushy textures. Back to the veggies, Brussels sprouts are very low in carbohydrates, only 5 per cup, so each serving of this side dish is around 13 carbs. Pair that with a zero carb meat, and you’ve got yourself a low-carb meal! My goal for each meal is to serve two vegetables, and ideally, one would be low-carb and one would be more starchy, higher in carbs. This dish kills both those birds with one stone! Prep and cook these two complimenting veggies at the same time to save on dishes, mess, and pots to watch! 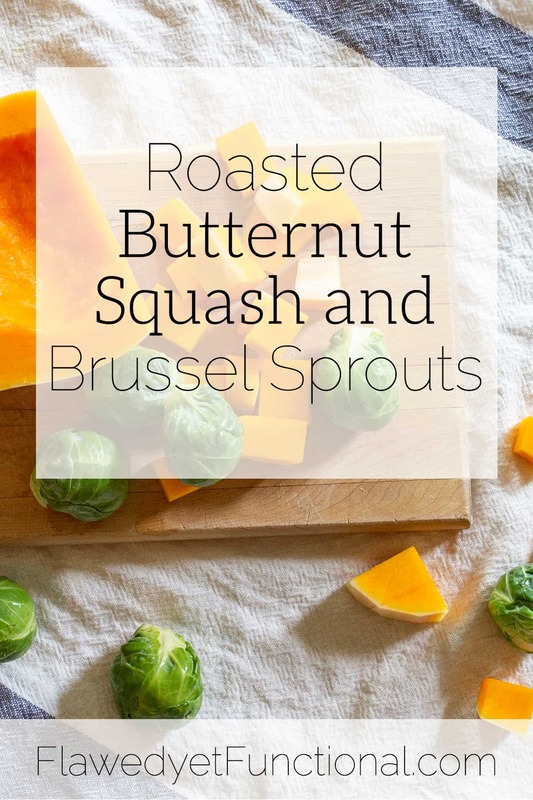 Roasted Butternut Squash and Brussels Sprouts is a savory, easy side dish that compliments any main course (I paired it with smoked bratwurst!). This dish is ideal for diabetics or keto folks looking for a satisfying vegetable side that will keep blood sugar/carbohydrates in line! Give this recipe a try and let me know what you think! A delightfully seasoned roasted vegetable blend. Sage, garlic, and onion work together to bring out the best in this AIP and Paleo side dish. Try it today! Preheat oven to 450°. Line two rimmed baking sheets with parchment paper and set aside. Using a vegetable peeler, peel the butternut squash. With a sharp knife, cut the ends of the squash off then cut in half, length-wise. Scoop out the seeds and pulp from the bulb of the squash with a tablespoon. Cut into slices then chop into smaller pieces, about 1/2"-3/4" dice. Trim the ends of the Brussel sprouts then cut in half. Place both vegetables into a large mixing bowl. Drizzle olive oil and seasoning over the vegetables and stir to coat. If vegetables look dry, add more oil. Divide evenly between the two baking sheets and spread out into a single layer. Bake at 450° for 20 minutes then stir each pan. Continue baking for 20-30 minutes or until butternut squash is soft all the way through and vegetables are nicely browned.